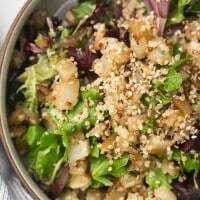 Sesame Roasted Turnip Salad with Quinoa | Naturally. Continuing on with the theme of making dinner and having lunch ready for the next day, this turnip salad uses one of my favorite ways to eat this root vegetable: roasted. This particular salad is using the same turnips from this barley bowl. 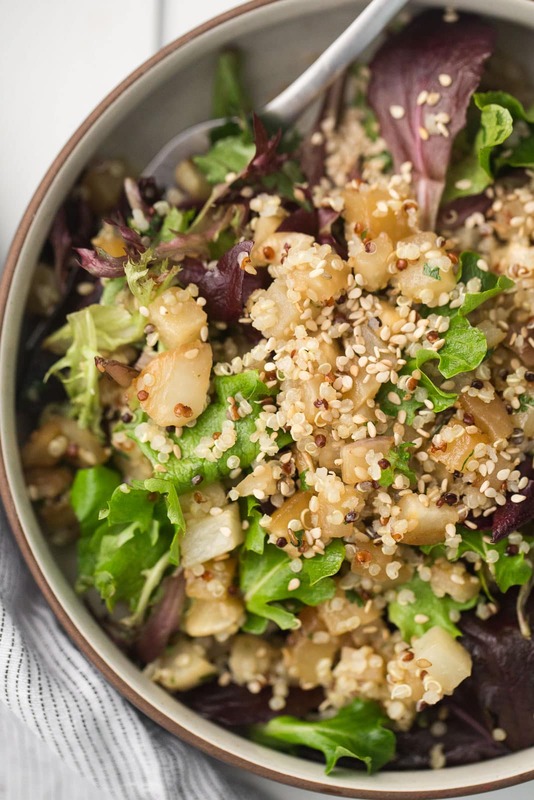 The turnips are roasted with sesame seeds, soy sauce, and honey which makes them just a little sweet which is great when paired with the earthiness of the quinoa/turnips. 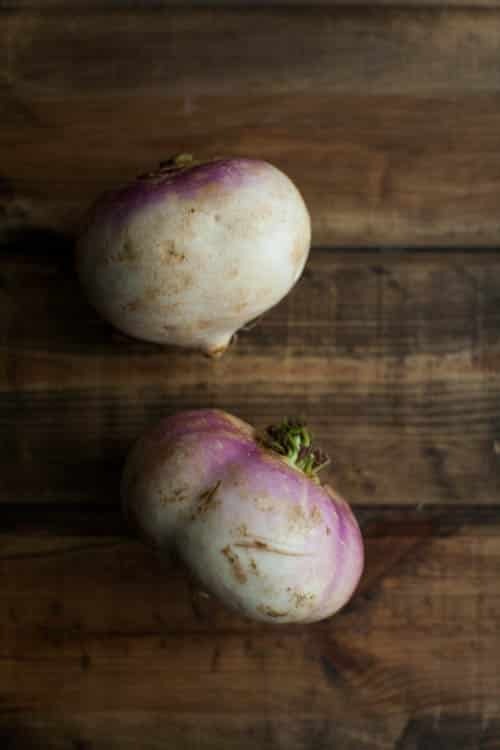 If you can find them, Hakurei turnips are perfect for this turnip salad. Preheat oven to 375˚ F. Cut turnips into ¼” cubes and place in a bowl. Add minced garlic, olive oil, sesame seeds, honey, and sea salt: toss until well combined. Spread turnips out into a single layer in a roasting pan and bake for 25-30 minutes until caramelizing and turnips are tender. Remove turnips from oven and add the soy sauce and cilantro to the roasting pan. Let cool. 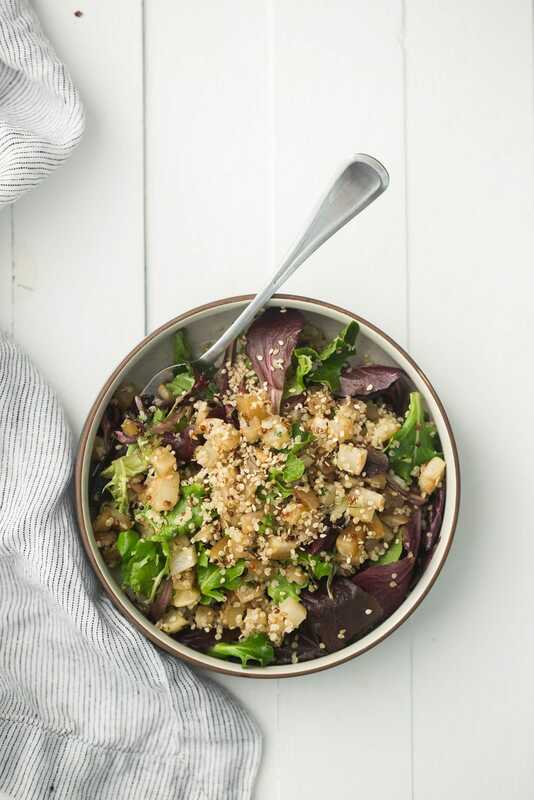 To assemble salad, toss the cooled turnips with the lettuce, cooked quinoa, scallions and sesame seeds. Whisk together the vinegar and sesame oil then pour over the salad. Toss until everything is well combined. Noodle Bowl: Top cooked soba or udon noodles with these turnips and an easy teriyaki sauce. Vegan: Swap out the honey for a bit of maple syrup or leave it out completely. Root Vegetables: If you have an assortment of root vegetables hanging around the refrigerator, toss them in with the turnips. Carrots, beets, parsnips, and rutabagas all great when roasted with a bit of soy sauce/honey. Turnips are one of the vegetables that is easy to ignore but shouldn’t. They have what I find to be the perfect balance of butteriness and earthiness (compared to other roots that are all earthy flavor). They are great roasted, grilled, and can be thrown into stir fries. Yum, this looks healthy and tasty! I don’t do nearly enough with turnips. I think they’re so underrated. Love your recipes, but would like to see the nutritional information added. Timing is PERFECT! I just got a huge bag full of turnips from my CSA…and kale. Now I know just what to do. Love getting these inspirations! Thank you. This Looks really good! I had been looking for turnip recipes! This seems like a good sour ce of inspiration! Thanks for sharing! pinned for later! I’ve never eaten turnips before (they kinda scare me) but maybe I’ll try this! It sounds tasty! Oh yum! I love the flavour combo of sesame, soy sauce, scallions, and cilantro. So delicious. I don’t think I’ve ever cooked turnips before so this looks like the perfect recipe to try! Made this as described, but using the Soba variation suggested. First time my husband hasn’t complained when eating turnips. Thanks for the recipe!